A stone carving commissioned by the Gibberd Garden Trust was unveiled in September. A second sculpture was also installed in the Garden, on loan from the artist. St Mel's Cathedral in Longford, Ireland, rebuilt after a disastrous fire, was re-dedicated in May 2015 and includes work commissioned from the artist. These include the cathedra in oak (working with furniture makers Rodney Forss and William Hall) and the Paschal candle in stainless steel (working with engineer Eddie Norris). 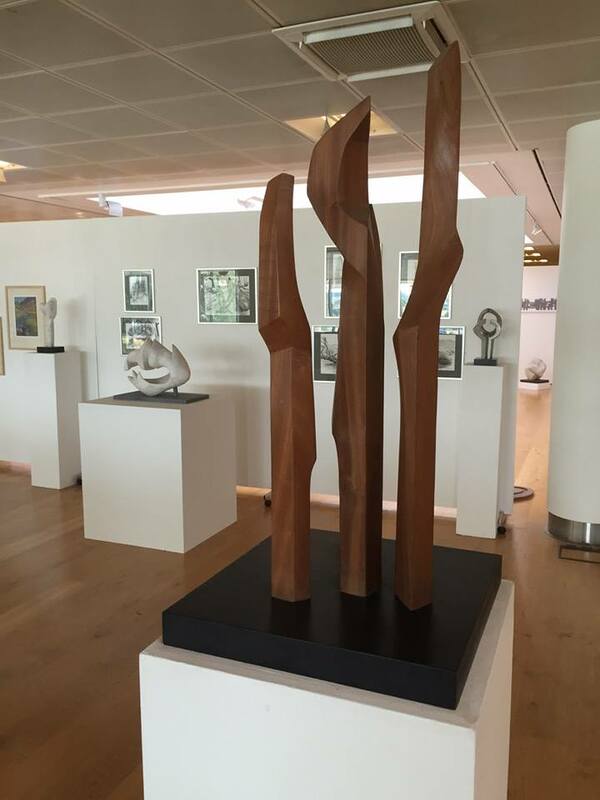 Wood, Stone, Steel and Paint at the Gibberd Gallery, Harlow: a retrospectve of the artist's commissioned works and her other sculptures and drawings, together with paintings by Alan Burgess. 'In Collaboration', an exhibition at The Gallery at Parndon Mill (see link below) featuring works in metal made in collaboration with Eddie Norris, 26th June - 3rd August 2014. New sculpture 'Bone Fragment' and tree drawings included in the exhibition 'Structure' at The Gallery at Parndon Mill (see link below) 5th July - 12th August. 25th June - 30th October: 2 stone carvings in 'A Decade of Sculpture' at the Harold Martin Botanic Garden, hosted by the University of Leicester. 7th April - 15th May: multiple drawing 'Forest Drought' in 'Climate Changes' at the Gallery at Parndon Mill. Tree drawings shown in 'Drawing from Life' at The Gallery at Parndon Mill. A stone carving, 'They Will Come Again the Leaf and the Flower...', was in Eastern Approaches, an exhibition of sculpture in the grounds of Hatfield House, Hertfordshire. Drawings of Great British Trees and a wood sculpture were part of 'Among the Trees', an exhibition at The Gallery at Parndon Mill. A new stone carving, 'Morning Glory Flower', was in the Summer exhibition at the Garden Gallery, Broughton, Hampshire. Silence of Growth, a stone carving for the Gibberd Garden, Harlow. Cathedra, celebrant's chair, Paschal candle, altar and processional candle holders for St Mel's Cathedral, Longford, Ireland. Five pieces in stainless steel for the new Catholic church at Waterlooville, Hampshire: processional cross, Paschal candle, two candlesticks and Sacred Heart sculpture. Bronze relief for new tabernacle for St Bartholomew's, St Albans. Eight new pieces for the new Catholic church at Latchford, Warrington (architects Hulme Upright) which was opened on 5th June 2010. These were; altar, font, lectern, plinths for tabernacle and for an exisiting carving, all in Stoke Ground limestone, the processional cross in stainless steel, the tabernacle in cast aluminum clad in stainless steel and a star of Bethlehem suspended from the roof under the central lantern. The latter was installed December 2010. All stainless steel work shown or listed on this website has been made in conjunction with the fabricator Eddie Norris.